It’s hardly a secret yours truly is a fan of Southwest Colorado history, so there’s no way I would pass up a chance to experience some of what it was like to live in the early days of Durango. 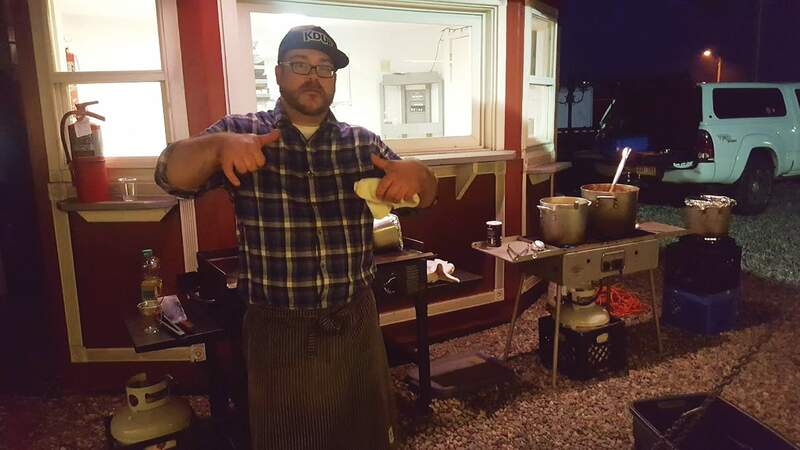 So the Culinary Heritage Dinner, a fundraiser for the Animas Museum, was a no-brainer, because what and how we eat says a great deal about the geography and foodstuffs where we live. The dinner was the brainchild of Fifth Street Eatery co-owner and chef Neal Drysdale and his friend and fellow gastronome Jeremy Foote. They researched, tested the recipes and prepared a four-course meal to die for, as they say. The dynamic duo worked to locally source most of the meal, although the train allowed early residents to enjoy luxuries such as oysters on occasion. The first course was inspired by a menu from the old Silverton Northern Railroad, built by Otto Mears and connecting Silverton and the now ghost town of Howardsville. It included potted peachwood-smoked trout, a selection of James Ranch cheeses such as a young Leyden made with cumin seeds and a Stilton, Mangalitsa ham from Cortez, roasted New Mexico pecans, Bent’s water crackers, homemade bread and butter pickles and lightly pickled green beans. An appealing nosh, no question. The potted trout, sometimes called rillettes, were popular in the 1800s because it was a way to preserve food. Using salt and topping the meat, mashed to a paste similar to pâté, with a layer of pork fat, it could be stored in the root cellar and it would last for some time. The second course was a hearty take on what miners in La Plata County would have enjoyed, Yankee-style baked Anasazi beans prepared with Mangalitsa bacon lardons and served with Blue Bird flour biscuits. Prepared with lard – because hey, that’s how they did it – the biscuits were light and fluffy, served with homemade butter, locally made Riverview apple butter and Honeyville honey. That probably would have been enough, but of course the menu had to include something from historic Strater Hotel menus, and Drysdale and Foote selected chicken salmi with sauce à la Russe, confit Yukon Gold potatoes and an heirloom tomato salad. The salmi was a deboned chicken thigh, pounded thin. seasoned and cooked with a crisp skin. The dish came from a 1901 menu from the hotel. The sauce, Drysdale said, is an old-time French sauce (despite the Russian name) that is rarely prepared anymore. Museum Executive Director Sherry Bowman said her main role was as a recipe taster. (Tough work.) She was a little disappointed the vinegar pie – which tasted like lemon, just so you know if you ever see it offered, didn’t make the cut, but the molasses cake with whiskey hard sauce and LB Farms Buttermilk Pie were delish. The buttermilk pie was similar to a pecan pie without the pecans and less sweet. The dinner was held Sept. 24 at the Grange Hall, the new event venue at the Durango & Silverton Narrow Gauge Railroad “complex.” Use of the site was donated by Al Harper, the train’s owner, one of many donations that allowed 100 percent of the proceeds to go to the museum. Others included tables and tableware lent by the Benevolent & Protective Order of Elks Durango Lodge, simple and appropriate potted chrysanthemums thanks to Botanical Concepts Garden Center, wine courtesy of Star Liquors and beer thanks to Brew Pub & Kitchen. HHHExciting things are afoot at the Animas Museum. It received a grant for $15,000 from the Colorado State Historical Fund in preparation for a multi-year $1-million (or so) plan for maintenance and renovation of the 1904 former-school that houses it. The money will be used to plan the project and do a structural survey in preparation for applying for a grant for the first stage of funding in the spring. Architect Dean Brookie is handling the design, and former museum Executive Director Robert McDaniel agreeing to serve as project manager. Projects will include fixing the stairwell, which is separating from the wall in places, installing an elevator on the rear exterior of the building to comply with Americans with Disabilities Act provisions, creating a small catering kitchen in the basement and working with the city of Durango and Mountain Middle School, located across the street, to extend a proposed park on both sides of West Second Avenue. The kitchen and the park could be rented for weddings and other events, Bowman said, saying she frequently gets calls requesting rentals. The Generations Research Library, something the museum has wanted to create for many years, is coming together. Featuring digital records of more than 21,000 artifacts – photos and three-dimensional objects – and 30-years’ worth of collected family files and news clippings, the library will be opened once policies are in place to ensure the hard copy documents don’t walk away. For those who don’t know, the museum operates on a budget that makes the shoestring analogy look extravagant. Volunteers take home the trash so the museum doesn’t have to pay city fees, and if there’s an event, they also take home the dishes to wash.
One big expense that most of us don’t think of is maintaining the climate-controlled upper floor archives, which must be maintained at a constant temperature and humidity year round. Bowman said that bill is at least $24,000 annually, before the museum even opens its doors. Neal Drysdale, co-owner and chef at the Fifth Street Eatery, discusses the details of what he’s preparing for the Culinary Heritage Dinner benefiting the Animas Museum at the end of September at the Grange Hall, a new event-center at the Durango & Silverton Narrow Gauge Railroad “complex.” The menu, researched with his friend Jeremy Foote, included dishes from the 1901 Strater Hotel and Silverton & Northern Railroad menus.